As part of its efforts to reduce child and maternal mortality and increase the health and well-being of children in the developing world, the Lasallian Foundation is focusing its Christmas Appeal on raising vital funds to promote girls' education. By donating just $53 today, you can help ensure every girl gets the education she deserves. With your help, the Lasallian Foundation can continue to provide a quality education for girls in a safe and secure primary and secondary school. Your donation can also help provide basic nutrition, clean drinking water and sanitation programs. Your gift will also support vocational training programs for young women who are unable to continue their secondary schooling and as a consequence are left unemployed. Your donation will help girls like Kalani, living in one of the most disadvantaged slum areas of the Sri Lankan capital, Colombo. She was only 14 when her parents forced her to drop out of school to look after her younger siblings because they were too poor to keep her at school. 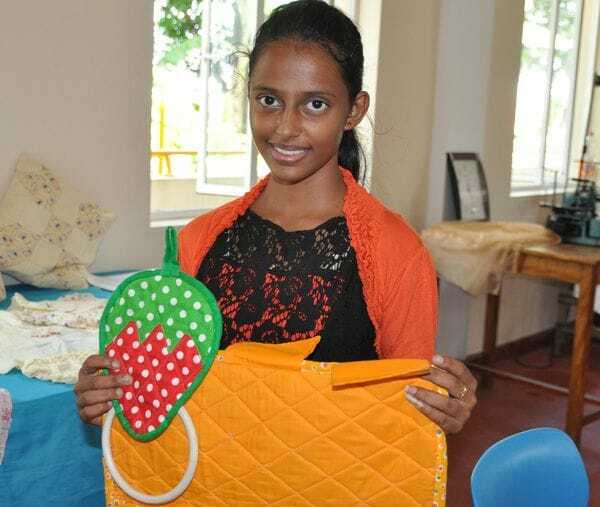 But thanks to the Lasallian Foundation, Kalani has been able to continue her education through a free sewing and patchwork course run by Lasallian Education Community Services near her home in Mutwal. Kalani has excelled in her course and now works from home, sewing for her family, friends and local community and is now able to make enough money to pay for food and utilities for her whole family, so her younger siblings can now also complete their education. It really is a no-brainer. By educating girls, we can help reduce poverty and encourage future generations to embrace their full potential. Through a donation to the Lasallian Foundation Christmas Appeal, you can help break down the barriers to girls education and make a difference in some of the poorest countries in the Asia-Pacific region. Share this with your family and friends and together you can embrace this opportunity to make a difference to a girl.